Monin's delicious flavored syrups are ideal for a variety of uses! 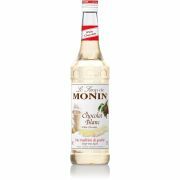 Monin's flavored syrups are ideal for coffee drinks as well as for cocktails, desserts and baking. Also try ice coffees with various tastes! Would you like a vanilla latte, chai latte, hazelnut coffee or perhaps coconut-flavored ice coffee?